Every so often, news stories come along that seem to tell the story, but, when enveloped in a larger context, turn out to be a shadow of the actual truth. Reading yesterday’s Los Angeles Times, old school (in paper! 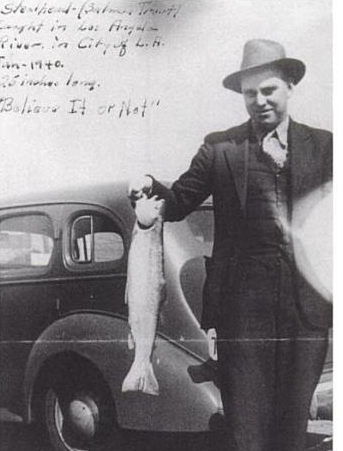 ), I found environmental writer Louis Sahagun’s “Searching for the elusive steelhead trout,” to be in need of context and rebuttal. Those newshounds among you know that Vox, formed by some former Washington Post staffers, thrives on its policy of “understanding the news.” Context in this digital age is king. If I’d never fly-fished or reported on the L.A. River, I would have read Sahagun’s piece and asked “Why would anyone attempt a fish study in this toxic waste water?” and probably had a very good laugh at the photograph of the fool from Trout Unlimited with a sock attached to his line, and snickered at the abandoned shopping cart shot. But, as it stands, I have a platform to cry foul on this piece. I started lariverflyfishing some four years ago with the tagline “fishing for carp, waiting for steelhead,” and have amassed over 1,000 followers and 46,000-plus hits as of this writing. For those of you who actually do enjoy recreational fishing in Glendale Narrows, you know this story doesn’t begin to tell the broader context of our river. And for those of you who participated in the latest clean-up efforts, you know that if Friends of the Los Angeles River, the organization that has organized clean-ups for the past 25 years, had gotten a piece of this area, the junk would have been removed. FOLAR released “State of the River: The Fish Study” six years ago. This singular Los Angeles River study combed four areas for fish, a Glendale site, Newell site, Figueroa site and a Riverside site. The seine nets captured carp, tilapia and sunfish in significant numbers. Because of this study I realized an LARFF contributor had really caught a legend when he recently captured a largemouth bass, because only one appeared in the study, as compared to nearly 250 tilapia. This fly-fisherman is staking carp, a non-native species of the Los Angeles River. Would all carp be killed in the river once reconstruction begins? Read the entire story by Louis Sahagun here. With the public comment period for the long-awaited ARBOR study coming up this spring, the Corps may have a public relations nightmare on its hands. In this historic moment, the pubic will weigh in on which of four alternative reconstruction plans makes the most sense. That plan will then be sent to Washington for approval and funding. Make no mistake, the river will be changed, no matter which plan moves forward. The Corps and the city of Los Angeles are partners in the redevelopment. Just last week, I walked part of the river with a Corps biologist, who told me that she studied maps from the late 1800s to see which plants were prevalent along the river during that time. Re-establishing those plants along the river will undoubtedly be part of all four alternatives. Up until this happened, Sepulveda Basin was the beautiful place where environmentalists, river advocates, Los Angeles and the Corps had found common ground. But with the Audubon Society calling for an investigation into the loss of habitat for 250 species of birds, as well as mammals, reptiles and fish, my guess would be the trust the Corps has been building within the community has been sheared by their bulldozer’s edge. Developing. Stoked by a warm-water fishing article that recently appeared in Cal Fly Fisher mag, my son and I stopped in Lone Pine over the weekend to check out the lower Owens. After all, I’d fished the ponds behind Bishop for bass and panfish, and this piece sang the praises of throwing a bass bug into the river’s hot summer waters. After a two-minute ride from town we found, yes, more water flowed; the weather was unseasonably hot as blazes; and we did spot a good-sized bass near a bank. But now for that all-important cast … bonk. Only the croak of an insistent bull frog kept us smiling. The looming LORP problem for the fly fisherman remains terrible access. 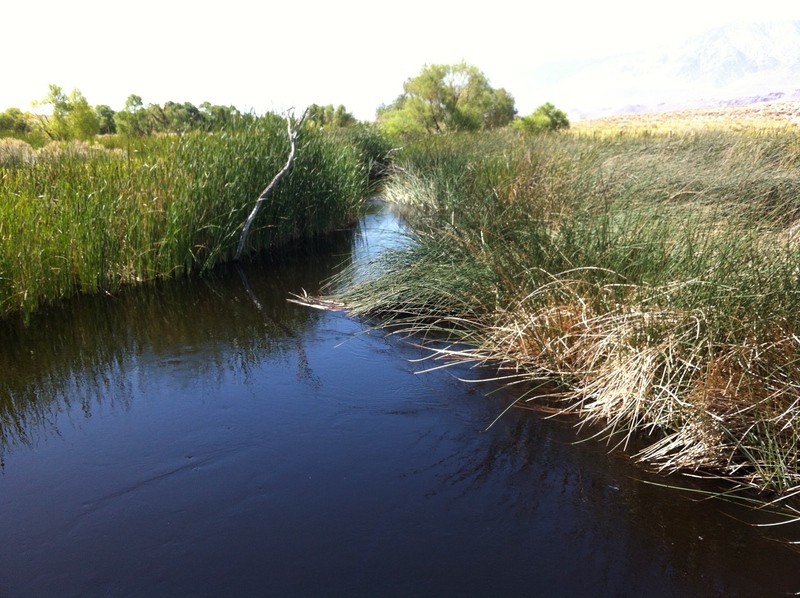 If you’re a tule, you’re really a happy camper surrounded by lots of your tule friends, but if you’re struggling through them, fly rod in hand, feet in the muck leading to where you might find the river’s edge, it’s just not so good. Casting? No way. The only casts we got in were right next to the road. 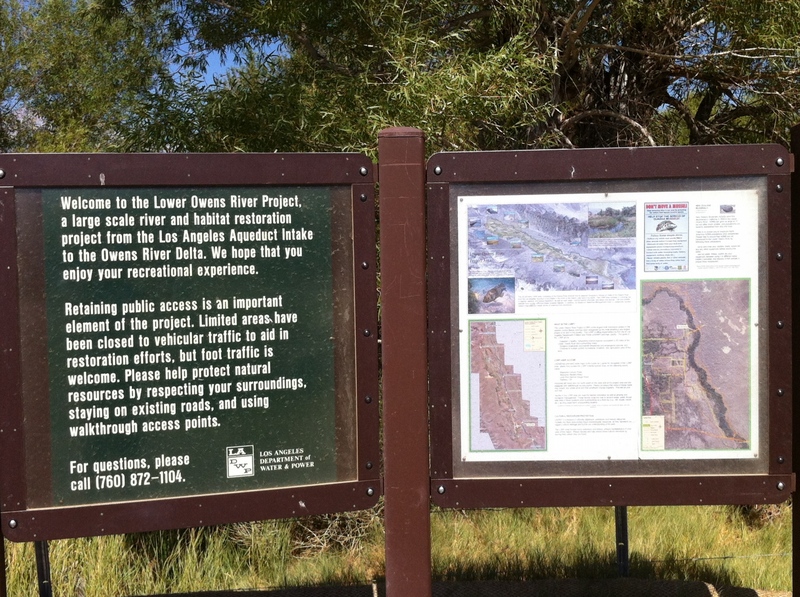 He was writing about the Lower Owens River Project, LORP for short, that began about six years ago when L.A. Department of Water and Power began putting more water into the river that it had diverted to Los Angeles Aqueduct since 1913. It’s a shame to have the restoration project in full swing, as evidenced by the nifty explanatory signage about the project and a new, shiny access gate, and not be able to fish. Anybody got a lawn mover? I’d skip this one until there’s a solution, possibly like the disabled fishing platform on the ponds outside Bishop. 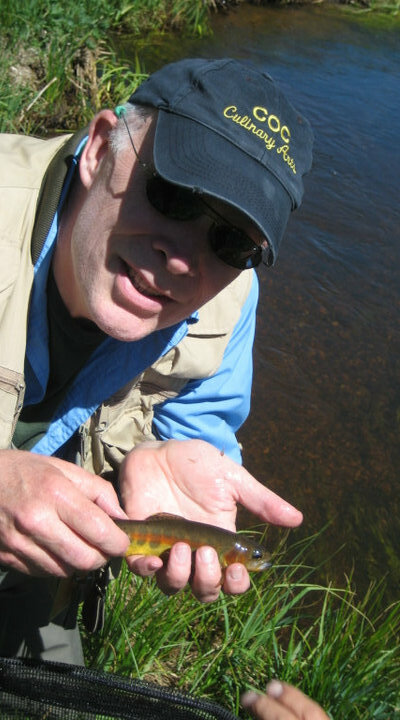 Golden Trout: The state fish is small, but beautiful (Courtesy Guy Jeans). Last summer, a friend and I caught dozens, and dozens, and dozens of Golden Trout, all in one glorious day. Some days on the water produce memories akin to what used to be called a “Polaroid moment,” living for a long while in one’s memory. That was one of those days, when the weather is perfect, the company, just right, and the fishing, downright fantastic. So it was with keen interest I read Louis Sahagun’s recent piece in the Los Angeles Times about ranchers rights within the Golden Trout Wilderness and the fate of our state fish. 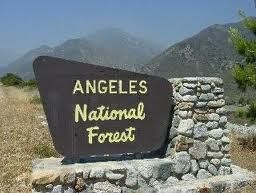 The GTW is a massive 300,000-acre area that sits on the Kern Plateau and is accessible from at least three directions. On its eastern edge from Lone Pine, off Hwy. 395; from the south, accessible from the Sequoia National Park around Mineral King, itself a 30-plus mile adventure on a one-lane, dead-end road; or going north from Kernville. Size does matter, of course, but a 10-inch fish here is a monster, with the average running around 5-to-7 inches. They are a feast for the eye, with two red stripes, one on the belly, the other along the lateral line, running to the mouth and under the gill. Also, look for large black spots – up to 10 – that run laterally as well. Put these together with a predominately yellow-gold color and there’s little reason for their cousins to enter the beauty contest. 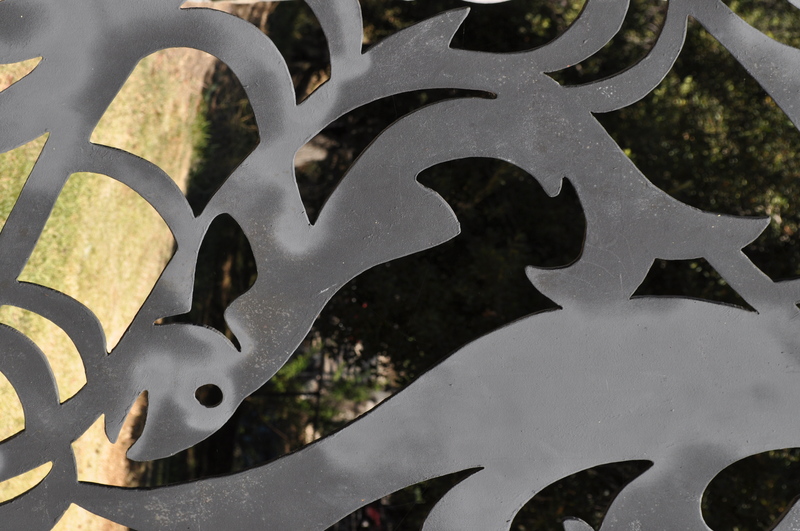 David Lentz, who is California Department of Fish and Game’s native trout conservation coordinator, said that the small size is because of 140 years of habitat degradation. “Continued livestock use results in shallower, wider, warmer water,” he said. Waters in their natural state would be both narrower and deeper, which, in turn, would mean fewer goldens that were bigger. The largest section of interconnected meadows for grazing lies in the South Fork of the Kern area. Sections are now being rested for eight-to-nine years at a time to regain this natural habitat. Some environmentalists have argued that the best way to prevent lifestock from grazing in the upper South Fork watershed is to get goldens listed on the Endangered Species Act, according to Behnke. Meanwhile, you can volunteer for hands on projects to restore this fragile habitat through the Golden Trout Project.